While the world is focused on the first deployment of US marines in Iraq in nearly a decade, as “humanitarian advisors” of course so as not to destroy the Nobel peace prize-winning aura of the US president who is rapidly becoming a warmonger on par with his predecessor, a far more dangerous development took place overnight with nobody noticing, when the Pentagon announced that approximately 600 soldiers from the Army’s 1st Brigade, 1st Cavalry Division will deploy to Poland and the Baltic states to help reassure European allies who feel threatened by Russian military moves. And while most Americans may be geographically challenged, Russians know very well that all of these countries border on Russia. As such this very demonstrative military expansion by NATO powers to “pre-contain” Russian military agression will only lead to one thing: even more “defensive” escalation. 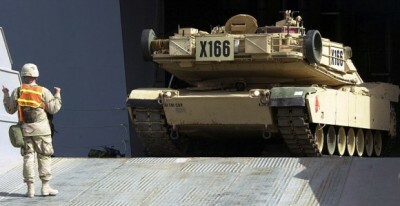 The troops and their equipment — which include M-1 Abrams tanks, infantry fighting vehicles, and armored personnel carriers — will go to Europe in October for athree-month series of training exercises. The troops will originate out of Fort Hood, Texas (keep this in mind for a post later today) and will replace 600 paratroopers from the Army’s 173rd Airborne Brigade. “These land training exercises … help foster interoperability through small unit and leader training,” Pentagon spokesman Col. Steve Warren said. In addition to ground forces, the U.S. has also sent F-16 combat aircraft to Poland and participated in NATO air policing missions over the Baltics. The exercises came at the request of host nations that fear a resurgent Russia, which annexed the Crimea region of Ukraine earlier this year and continues to support a pro-Russia separatist movement in eastern Ukraine. So to summarize: the countries that are most worried about Russian military aggression, those which by definition border on Russia, have decided to preempt Russia and demand additional US military presence on their territory, believing that the Kremlin will not see this US military build up as one which threatens Russia with even further NATO expansion on its borders. . It seems [Putin] had a Plan B in case things escalated out of control, one that fits with what we wrote a few days ago when we reported that “Russia casually announces it will use nukes if attacked.” Namely, as Bloomberg reports citing Bild, Russia quietly stationed a double-digit number of SS-26 Stone, aka Iskander, tactical, nuclear-capable short-range missiles near the Polish border in a dramatic escalation to merely verbal threats issued as recently as a year ago. This comes from an article titled “Russia Stations Tactical, Nuclear-Capable Missiles Along Polish Border“, in which we explained how Russia has done precisely this when it stationed a “double-digit” of SS-26 nuclear missiles in Kaliningrad on the border with Poland, over “concerns” what NATO encorachment close to its territory could imply. And now, NATO appears to have decided to find out just what Russia’s response to such an incremental tactical arms build up will be.